Your support moves teens from foster care into adoptive families. 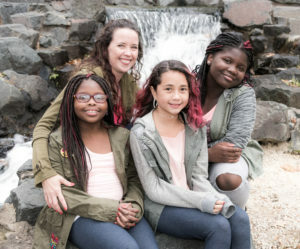 A month ago, 15 year old Valerie called her Ampersand Families Permanency Specialist and told her that she was packing up her summer clothes, making room for winter clothes. She was in tears on the phone, because it occurred to her as she packed that she might still be in the same group home next summer and having to unpack her summer clothes, another year without a family. Last week, Valerie unpacked her bags for the last time. After years of waiting, she is settling into the idea that she has committed parents who are prepared to walk with her into adulthood. Hundreds of older youth are in limbo in the state’s foster care system. Prepare kids and families for their permanent commitment. The road to adoption requires months of relationship-building, training and time-consuming official steps. Create support networks for youth and parents. Finalizing adoption is just the beginning; lifelong success for kids and families requires long-term educational, medical or therapeutic services. Make a one-time or recurring gift online now. Send your check, payable to Ampersand Families, to 2515 Wabash Avenue, Suite 150, St Paul, MN 55114. Give in honor or memory of a special person or important occasion by mail or online. Let us know if your employer matches your charitable giving. Support Ampersand Families with every purchase you make on Amazon! To make a planned gift or learn about other ways to contribute, contact Michelle Chalmers at michelle@ampersandfamilies.org or 612.605.1904. Thank you!